Christopher Nolan’s Interstellar is as much about outer space as it is about our own planet. The story arc begins with a dying earth that can no longer support humanity and ends with a lesson on what it takes to survive. 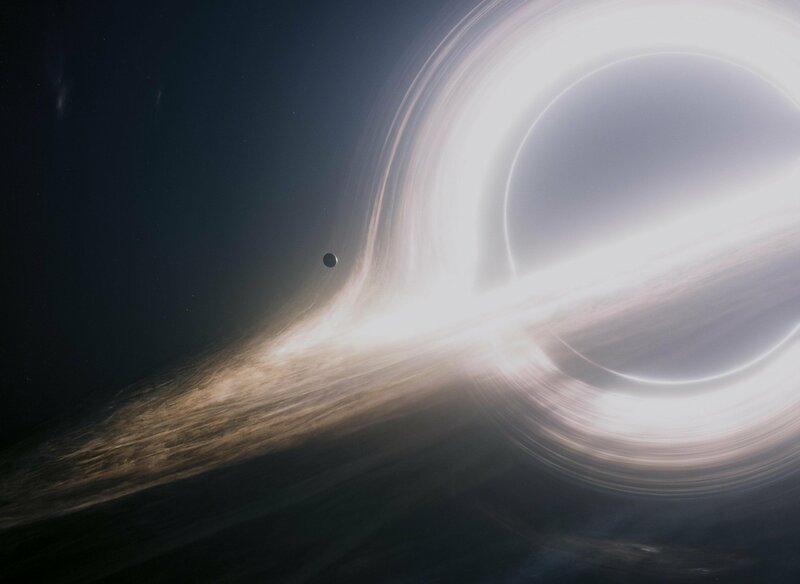 A supermassive black hole in Interstellar. Image: Paramount Pictures/Warner Bros.
Interstellar depicts our planet as a place ravaged by dust storms, blight-causing fungi, failing crops, and a changing role for humans in the Earth system. If this sounds familiar it is due to decades of post-apocalyptic narrative in pop culture. But there is an ever-evolving undercurrent in epic films in which planet Earth is being shaped by mankind to ill effect. Famous films such as Ridley Scott’s Blade Runner show a filthy, unending cityscape world devoid of plants and animals. In Steven Spielberg’s A.I., the oceans have risen tens of meters above their current level. Thus, what used to be Sci-Fi has now become Cli-Fi as climate takes center stage as humanity’s nemesis. An even more interesting fact is that many of these movies are warnings about what could happen if human activities continue unchecked. The Day After Tomorrow took an interesting theory of the Earth’s past climate into an impossible superstorm that consumed the northern hemisphere and attributed unchecked warming of the oceans to humans. Snowpiercer depicted our planet as a frozen wasteland after humans attempted to counter global warming with a geo-engineering method that backfired. Even James Cameron’s Avatar mentions earth as a planet missing green. Perhaps the most interesting fact is that a climate apocalypse is common knowledge to most moviegoers. It’s as if we as a society already know what’s coming, sometimes regardless of political views. In the end the most compelling part is what happens after the climate has already changed. There are lessons to be learned in Interstellar. How does humanity react to a global scale shortage of food? What happens to our governments? Our daily lives? Echoes of the past are sprinkled throughout Christopher Nolan’s epic. The North American Dust Bowl of the 1930s very much comes to mind with the dusty scenes in the main character’s farm and local town. How it could happen on a global scale is harder to fathom, but there are clues in Earth’s history to bigger plagues and natural disasters. It is the human factor that is central to the narrative of Interstellar. In the movie, climate change has already happened for a civilization that was ill prepared to have its role in the cosmos erased by its own actions. We in the present still have time and can still steer our course in a better direction. It is why we study the climate and its impacts, and why governments are acting as we speak. Interstellar is a story of man versus himself masquerading as man versus nature. It is a voyage to the stars to escape the desolation of a climate changed by humanity. But we still have time and we don’t need to leave Earth yet. We can still save it. Dr Mera, great blog post on cli fi. for more info, see my cli fi central tweet feed at @clificentral and my blog at korgw101.blogspot.com and email me DM me, PS – I coined the cli fi term !